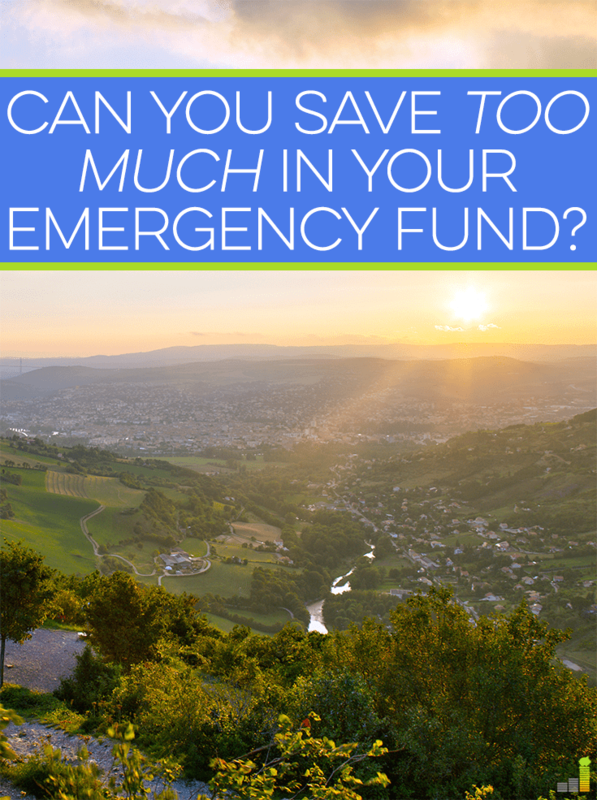 Can You Save Too Much in Your Emergency Fund? Financial security has become very important to me in recent years. I hate the feeling of living paycheck to paycheck and being in debt, so much so that I decided to do something about it. Once my husband and I started to clean up our acts financially, we began to live off of one income and sock away the rest. Before we knew it, we had a pretty sizable emergency fund saved up, to the tune of about a year’s worth of living expenses. It felt good to have that amount of money backing up our lives in case something happened, and it’s actually what led to allowing me to quit my job in corporate finance a little over a year ago. I knew there was no way I was ever going to leave that job if I didn’t have a huge cushion to fall back on, and our emergency fund was my cushion. So I quit my job, we committed to living off of one income and continued to save like crazy, even with my loss of income. Getting to work from home as a freelancer while staying with my daughter has resulted in a huge increase of happiness in our household. It really has been wonderful, and I realize that our emergency fund helped us reach that goal. But after a year of having that money languishing away in a little-to-no-interest-bearing savings account, we decided we needed to do something with it, because we were basically losing money on it due to inflation. Anytime we’ve had any little emergency arise, such as our hot water heater going out, we’ve been able to work it into our budget rather than touching our emergency fund, so that money just continued to sit. What we realized in this whole process is that we had way too much money socked away, giving us nothing, except for a little bit of added security. We decided to keep enough money in there to continue to give me an (albeit smaller) sense of security, and we assessed our other financial assets. Our money should be working for us rather than depreciating in a bank account somewhere, and we should let our other assets work for us instead. It took only a little bit of convincing from my husband to remind me that we have plenty of sources of cash that we could drum up if we had to in a dire emergency. If something were to happen, we could get a loan on either of our paid-for cars or even sell one. I’m not saying it would be ideal, but emergencies don’t always happen, and this is just in case of emergency, such as a major health scare that insurance wouldn’t cover. It would be a way for us to pay some bills if we had to, and if things got really bad, we could always mortgage our house again since we have so much equity in it. We definitely still have a healthy emergency fund. 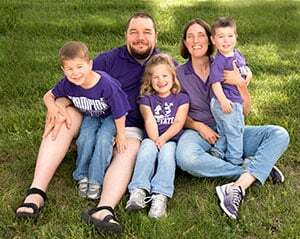 We aim to always keep $10,000 to $15,000 in our online savings account at Synchrony Bank who pays 1.85% at any given time, and that still is a big chunk of change, but it’s what makes us comfortable now, and that number is always subject to change. Everyone has a different situation and level of comfort, but I do believe we got carried away with the amount of ours, especially considering the two assets we have sitting in our garage. I’ve recommended to people before that a year’s worth of emergency fund is a great amount to have, but I’ve definitely changed my tune on that in the last few months. It can be difficult for many people to save up that amount, and it’s unnecessary in most cases since emergencies are (thankfully) rare, so I’ve changed my tune. Do you have a large emergency fund, or do you rely on other assets to cover needs? 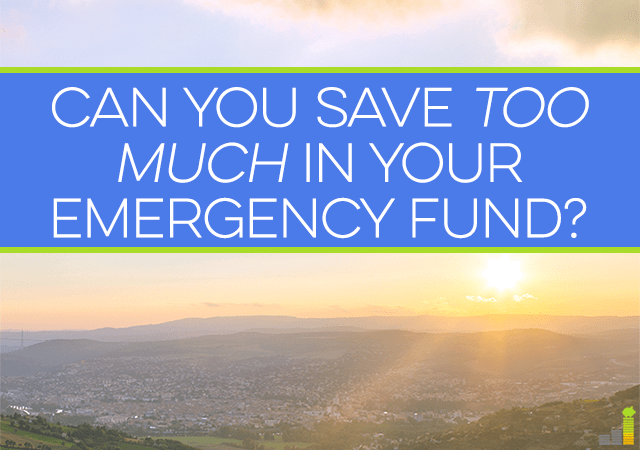 Do you find it challenging to save up an emergency fund? What do you think is a relatively good amount to shoot for in an emergency fund? We’re rebuilding our EF after 2 years of more expenses than we’d have liked. Not to mention our business was a bit slow as well. I do think it’s important to pay off debt as soon as possible, it’s what we’d have done ourselves in your situation, too. We do have some money stashes away, but I’d like us to have a bit more. And then we’d invest, otherwise the money is not used to its full potential. At least you had that EF to fall back on when you needed it though. Good thing it was there and you guys are building it back now. Yes, there is such a thing as having too much cash in an emergency fund but as almost everything in personal finance, it all depends on your situation. Some people’s situations will require higher cash reserves if their job is less secure or have higher potential for emergencies (ex. medical issues). I personally shoot for about 3-6 months of expenses, which for us is about $10-20k. I have no problem keeping this money as cash because I can tap into it at anytime I need. 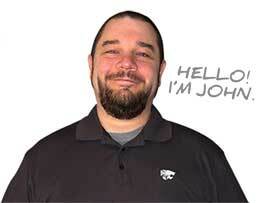 It provides less headaches in trying to secure cash than if I had to try to tap into assets. If I need to tap into my reserves, there is a good chance I already have enough stress going on I don’t want more trying to turn my assets into cash. We kept a higher one at first because I was leaving my guaranteed salary and my husband is commission only. I wanted that cushion, but now that it’s not quite so big, I’m okay with it! We fell into the same boat as you with hoarding away too much money and not putting it to work. The argument between investing and paying down your mortgage is endless, so I won’t go into that. The important thing, as you pointed out, is to come up with a way to make your saved money work for you. Whether that’s paying down longer term debt, investing, or starting your own business, if you leave your money sitting around you are doing yourself a disservice! Yes, the mortgage vs. investment debate is endless! We paid down the mortgage because it’s been our number one goal for a long time, and that helped us take a huge chunk out of it. It feels so good! We are definitely guilty of letting our emergency fund get too big. My excuse is always that we have rental properties and need extra cash if things break! I have been trying to keep our E-fund on the lower end since earlier this year. I would probably keep more in ours if we had rental properties as well, Holly. I don’t blame you for that. With multiple properties, you never know what can happen. I’m with you! I like the $10k number personally, but I think it depends on the person. I keep telling my brother he has way too much money sitting in the bank not earning any interest (and not going toward his student loans for med school), but he really likes the security of it. I think it’s hard to justify when you get into the $50k-$100k range. You are really missing out on a lot of interest. Great topic! I don’t know why we kept so much in a low interest bearing account for so long. I wonder if I had gone ahead and invested it if I would’ve used it all to pay down the mortgage. We probably keep too much in cash, but with our rentals, we’ve seen $5000 or more go easily down the drain with a big repair. I think we shouldn’t have any other large expenses for a while, so I think if we can keep about $10K in a personal emergency fund and $10K in the rental fund that would be adequate for our needs. Whatever lets you sleep at night! 10k in each is a healthy number, especially if you have an investment property. I don’t think that’s too excessive. We keep a year’s worth of expenses in “emergency funds” but only one month’s worth is in our checking account. Of the remaining amount, we have 1/2 in a higher interest savings account and 1/2 in index funds. Even if our emergency coincided with a 50% drop in the market, we would have six months for the market to recover a bit, and if it didn’t we would still have 3 months of expenses. For us, this is a good compromise. That’s a great compromise, and one that I wish I had done when I had so much more sitting just in savings. Thank you for this! We have a large EF and haven’t even thought about reevaluating it although our house just sold. I completely forgot about this. Now that we no longer own a house, it’s an area where we can probably decrease since there is no chance of a major home repair or anything like that in our horizon. I’m so excited for you to become mortgage debt free at the end of the year. That’s awesome! I’m in the process of building up my emergency fund but it’s difficult when you’re aggressively trying to pay off high interest debt. Currently our needs are very low and I’d feel comfortable with saving at least 6 months of expenses. Since I know we will always be earning some type of income, having a years’ worth of expenses saved up sounds a little high to me as well unless we were planning on leaving our jobs and traveling for an extended period of time or something. There’s definitely a balance between saving up additional funds and paying off debt. You want to be covered in case something unexpected happens. And thank you! I’m excited, too! That sounds like a pretty good use of your money to me, and you are still keeping a decent chunk in your EF too. Way to go! We also invest part of our EF, but ours is in corporate bonds. Our mortgage is already paid off but even if it weren’t, we wouldn’t use the EF to pay it off. If you need cash quickly, selling a stock or bond gets us cash within one week, whereas taking out a new mortgage or home equity loan can take several weeks before you get cash. That’s incredible that your house will be paid off this year! Way to go! Our emergency fund (or lack thereof) has always been the unhealthiest part of our financial picture. At first we had too little in cash (all “EF”) and now we have too much in cash (non-designated). Now that our life is a bit more settled, I think we should define our desired size of EF, and, like you did, put the rest to to work toward our goals. I like the idea of having a tiered emergency fund -some cash, some conservatively invested liquid assets, some more aggressively invested liquid assets, and as a last resort non-liquid assets and Roth IRAs. We have some in each of those categories, just none defined as part of the tiered EF. It’s definitely advisable to make sure some of it is available almost immediately, such as in a savings account. But setting up a tiered system is a great idea, especially if you feel more comfortable having a larger EF. Good idea! I’m with you on the $10k, although it’s probably different for different people. I often think that my EF money is wasting away in a “high yield” bank account at 1% when I can have it work harder for me. I have a stable government job so the risk of a layoff is less. Plus, I tend to see ALL my money as an emergency fund. You might not want to withdraw money from a retirement account, but it is available to you in a true emergency. Plus, you can use credit cards to tide you over for a few weeks before the balance is due which gives you time to access your other accounts. I’ve thought about credit cards as well. I just worry it would be a slippery slope, so I think I’d charge up a card first and then try to liquidate some assets in the meantime to pay off the card before the payment was due so I could pay it in full. Great post Robin. I actually had the same issue a few months ago and did something about it…paid off a big student loan! It felt great and I realized that we don’t need that much in our e-fund either. As an eye doctor, I’m in an always in demand field (hopefully), so I don’t feel like we need a year or even 9 months of expenses. I’m okay with 6 months, since I’m using anything extra to get out of debt. It’s interesting how I don’t typically think about this “problem” and my first reaction was “that’s a silly question.” But in reality there are a TON of people who have a huge amount of their assets in cash. I have an uncle who literally has almost all of his money in real estate or cash. It “worked out” for him, but he really could have made a lot more money if he had simply invested in it the stock market over the past few decades. My strategy is to put a large part of my EF into a ROTH IRA and invest in a diversified, low fee, dividend paying mutual fund. This way my EF is working for me and in case of an emergency, I can always withdraw the principle amount invested in the ROTH IRA with no tax penalty. Why not put all of your EF in your Roth IRA? At least, up to the maximum amount allowed per year by the IRS. Like you said, there’s no penalty to withdraw what you actually put in of your post-tax dollars. The penalties would only by occurred if you removed “profits”. But I believe, after 59 1/2, you can actually withdraw all of your moneys, include your profits, and not incur penalties. Although, it is IMPERATIVE you check with your tax accountant, to verify if the “59 1/2” age, for non-penalty withdrawal, is correct! I totally get it. We actually have a relatively small emergency fund. I’m building it up slowly, but I think the most I’d ever want is 6 months’ expenses. I’d rather have the rest allocated for other savings goals — and, of course, the expensive dental surgery we’re dealing with next year. So it didn’t make sense to sock away a ton of money in our EF while struggling to save for such a huge bill. Really nice post – I, even at only 24, realized I had way to much in my EF fund, almost $25K for just a little renter with no family! I had so much because I wasn’t educated on what “adult” emergencies costs – so I over-saved rather than over-educating myself and thus lost out of a few years of having my money work for me. Now I have my savings on a mission of putting 20% down on a home next year (it will happen!) and reduce my risk my learning more, not saving more. Your idea of paying off your mortgage is a good idea, yet I’m not quite sure how this is a whole lot different than just leaving it in the bank. At least from an investment standpoint. I know, you’re not having to paying interest on the mortgage, etc. But that equity in your house, is not working for you at all! Why wouldn’t you take that equity, and use it as down payments (pural) on other properties, i.e. : small apartment complex, or other types of income properties? But, of course, first doing your required due diligence, before jumping in! This way, at least your money is still working for you. While someone else is reducing your mortgage, with the rent payments you are receiving. You might also be able use your ROTH monies for this type of investing. It’s would at least be worth asking your accountant the question. Several years ago, I posed a question to my account, who works with individuals, and small to medium sized business. I asked him, of the most successful clients he worked with, what was the way they most often increase their investment portfolios. And what types of investments had acceptable financial risk/reward potential for their portfolios. He had a relatively short answer, which was the same for both questions. He said, his most successful clients had started small, and in invested in multiple unit apartment complexes. He said his clients, who used this approach, typically started with 3 to 4 unit complexes. The rationale being, if you have a multiple unit complex, one vacancy, won’t completely impact you when making your monthly mortgage payment. They would typically up-grade their builds, if needed. They would keep their properties for a few years, to build equity, and then they would sell. They would use the monies from the sales, as down-payments on their next larger piece of real estate. He continued his explaination by using his parents situation, as an example. He said his parents had recently purchased a 64 unit complex in an up-scale area of Seattle. He said the continuing income from this property is going to be a major part of their retirement. He also said, they had started with this investment approach in their early thirties. And,they had purchased, and re-sold multiple properties over the years. Buying a larger complex each time. Thought this type of approach, for at least portion of your investment dollars, might be of interest to you, and possibly to some of your readers. Please pardon any spelling errors in my above post. Sometimes my brain is going a lot faster than my fingers. It absolutely is a good idea and definitely one that I’ve thought about, at least the part about buying a small investment property. However, after being a landlord for a couple of years on another property we owned, we found that we really didn’t like the maintenance that goes along with it. Granted, we didn’t have the best experience with it, and plenty of other investors have great experiences being landlords, but it just wasn’t our thing. We need to let that bad memory wear off for a bit before we go down that road again. I know we have a paid-for house now, but I’d still like to be a little more financially secure before we even think about trying that again. While paying off your mortgage early might not be what everyone would do, especially if you are a big investor and have a low interest mortgage, it’s what made the most sense for us with our finances. It makes us comfortable, being completely debt free excites us, and we didn’t ignore investing for retirement while we paid it off either. There’s definitely a balance act between investing and paying off debt. I appreciate your well thought out comment! I’m sure many readers will find it beneficial.